As the summer comes to a close and parents begin to think about shuttling the kids off to school…well, let’s just say that office buildings and parking garages throughout the Lower Mainland are again buzzing with activity. This got us thinking about where the jobs are that everyone is returning to and where job growth has been throughout the region over the past few years. To help us answer these questions we turned to data from the 2006 Census and the 2011 National Household Survey (NHS). The Census and NHS tabulate employment data two different ways: one focuses on the details of employment by a respondent’s home location (Place of Residence - POR) and the other focuses on the details of employment by a respondent’s workplace (Place of Work - POW). The jobs data commonly reported in Statistics Canada’s publically-available Census and NHS Community Profiles typically provide details on the jobs held by a community’s residents, and hence are POR-based assessments of the size and composition of that community’s workforce rather than the number of jobs actually located within that community. While there is value in both counts, the POW data speak directly to the structure of a community’s job base and its primary economic drivers. As an example, the most recent NHS data show that employment by POR in the Lower Mainland (the aggregate of the Greater Vancouver, Fraser Valley, and Squamish-Lillooet Regional Districts) was 1,332,150. In other words, these data show that 1,332,150 of the region’s 2,629,092 residents were employed in 2011. This count includes residents with a usual place of work, those without a fixed workplace address, and those residents whose jobs were located overseas. In 2011, there were 1,143,995 total jobs with usual places of work in the Lower Mainland, including 1,042,970 usual places of work outside of the home and 101,025 people working at home. There were also 179,130 residents within the region who had no fixed workplace address and another 10,000 who worked outside of Canada. A custom tabulation of the Lower Mainland’s employment by POW, on the other hand, shows a total of 1,143,695 jobs being located at a usual place within the region in 2011: 1,042,710 at a usual place outside the home and 100,985 at home. Between 2006 and 2011, the Lower Mainland added almost 59,000 jobs with a usual place of work, going from 1,084,845 to 1,143,695 over those five years (a 5.4 percent increase). The number of usual places of work outside the home grew from 979,520 to 1,042,710 (6.5 percent), while those working from home declined from 105,325 in 2006 to 100,985 by 2011 (a 4.1 percent drop). It is interesting to note that if we consider employment change for residents without a fixed work address (from the POR side of the counts), these jobs grew the fastest over the past five-year period: from 159,115 to 179,130, or 12.6 percent. Conversely, the 2006 to 2011 period saw a decline in jobs located overseas, falling by 7.7 percent from 10,840 in 2006 to 10,000 five years later. Considering patterns of where job growth was within the Lower Mainland region necessitates a focus on jobs that were associated with a usual place of work (both outside the home and at home) as, by definition, we do not know where someone without a fixed workplace address is physically working, and are not really concerned with those traveling outside of Canada to work. Between 2006 and 2011, both the Greater Vancouver (GVRD) and Fraser Valley Regional Districts (FVRD) experienced growth in total employment at a usual place of work of 5.6 percent. That said, with a much larger employment base, the GVRD added almost eleven times as many jobs as did the FVRD: 54,535 versus 5,065 over this five year period. In contrast, employment with a usual place of work in the Squamish-Lillooet Regional District (SLRD) declined by 4.5 percent (the result of 750 fewer jobs) between 2006 and 2011. Drilling down to the municipal level, it is interesting to note that the seven fastest-growing municipalities in the Lower Mainland were all located on the region’s periphery. The District of Squamish experienced the fastest job growth in the region between 2006 and 2011, by far, at 25 percent. Despite the fact that Squamish added over 1,200 jobs during this period, declining employment in Whistler (18.9 percent) and throughout the rest of the SLRD (12.2 percent) resulted in the SLRD as a whole declining by five percent between 2006 and 2011. Surrey had the second-fastest growth rate at 17 percent, having added 19,800 jobs between 2006 and 2011. Port Moody’s 850 additional jobs represented a 13 percent growth rate, making it the third-fastest growing municipality, while the District of Langley, Abbotsford, Port Coquitlam, and Chilliwack each grew at a rate of between eight and nine percent. 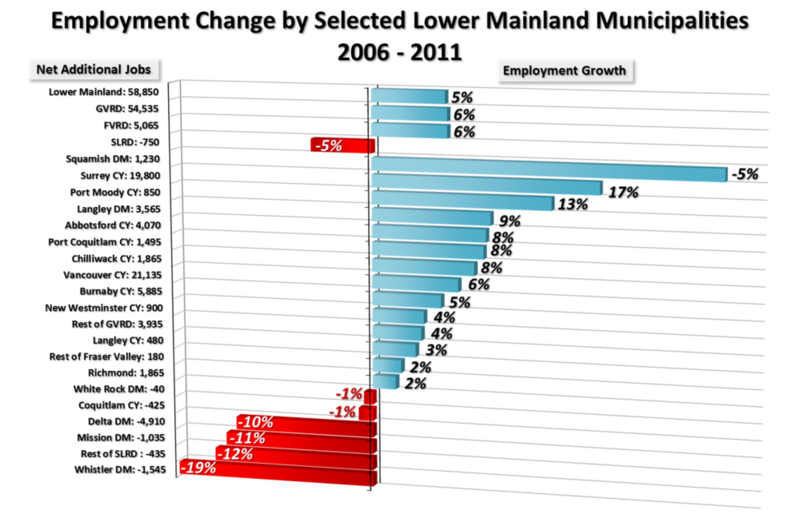 Employment growth in all other municipalities was below the City of Vancouver’s six percent growth rate. Despite a relatively slow growth rate (six percent), Vancouver added the greatest number of jobs between 2006 and 2011, at 21,135; following close behind was Surrey, which added 19,800. The number of jobs added in Burnaby, at 5,885, placed that city in a distant third place within the region. At the other end of the growth spectrum, White Rock and Coquitlam experienced marginal employment losses (40 and 425 jobs lost, respectively), while Mission, Whistler, and Delta experienced more significant declines that ranged between 1,500 and 4,900 jobs. How did employment on our main industries change? Relative to total job growth of five percent, employment in Public Administration grew by seven times the regional average, or by 35 percent, between 2006 and 2011; this was the result of the public sector creating 16,550 net additional jobs throughout the Lower Mainland. Vancouver accounted for more than a quarter of the increase in employment in this sector, having added 4,395 net new jobs in Public Administration over five years. Growth in the ten to 12 percent range was seen in Education, Health and Social Services, Construction, and Finance, Real Estate and Insurance. Professional and Business Services, Transportation, Warehousing and Utilities, and Other Services also saw above-average growth rates, ranging between five and seven percent. Trade, as well as Accommodation and Food Services, each saw below-average growth at three percent. Declining employment in Primary (2,690 fewer jobs; 12 percent) and Manufacturing (19,865 jobs lost; 19 percent) combined to reduce employment in these two sectors by more than 22,500 jobs. Abbottsford saw the largest declines in Primary sector jobs (a loss of 1,100 jobs; 22 percent), while the greatest loss of jobs in the Manufacturing sector was in Vancouver: there were 4,600 fewer Manufacturing jobs in the city in 2011 than in 2006, representing a 27 percent decline. While most industries maintained their respective shares of regional employment between 2006 and 2011, the above-average growth in Public Administration (35 percent) resulted in this sector’s share of regional employment growing from four to six percent. In contrast, Manufacturing saw the largest movement in the other direction, going from nine percent of the region’s employment in 2006 to seven percent in 2011 thanks to its 19 percent decline. To wrap things up, there are a couple of interesting takeaways from the POW employment data. First, the region’s jobs base is growing—to the tune of almost 59,000 net additional jobs between 2006 and 2011. This growth is being driven by Education, Health Care, Social Services, and Public Administration sectors, which accounted for three-quarters of total net job growth in the region. Second, the Lower Mainland’s more peripheral communities are experiencing relatively rapid jobs growth when compared to the historical core of the region. This means that as this summer comes to a close and people return from summer break, folks will be heading back to jobs that are spread out across a more diverse geographic landscape than has been seen in the past. As we noted at the beginning of the article, employment data were obtained from Statistics Canada’s new non-mandatory NHS, which replaced the mandatory long-form Census questionnaire in 2011. Due to the voluntary nature of the NHS, several data quality issues arise. First, in instances where data tabulations are complex (involving dimensions with many sub-categories), some data may be suppressed, resulting in published totals that differ significantly from the sum of the underlying numbers. Further to this, in some smaller geographic areas, data may be completely suppressed due to what has been deemed an unacceptably-high non-response rate (a global non-response rate, or GNR) by Statistics Canada (that is, above 50 percent). One example of this is Bowen Island, which was not reported for this analysis due to a GNR that was above 50 percent. Second, there is the possibility of non-response bias in the NHS data if those who chose not to respond to the NHS were systematically different from those who did respond. For example, if non-immigrants were more likely to respond than recent immigrants, than the NHS may over-represent the characteristics associated with non-immigrants and under-represent the characteristics of recent immigrants. The extent to which this occurs is dependent on both the specific data dimensions and geographies being considered, and thus the impact of non-response bias cannot be identified or measured. Within this context, it is important to note that changes in the data between the 2006 Census and the 2011 NHS may in part be attributed to short-term patterns and trends, and in part to changes in the collection methodology for the NHS data itself. That said, it is not possible to determine the degree to which each factor is contributing to temporal changes in the data. Usual place of work refers to those working from home as well as those who work outside of the home. This includes persons who do not go to the same workplace location at the beginning of each shift/work day. Some examples include building and landscape contractors, travelling salespersons, independent truck drivers, etc.